Some banners at the rally read 'Sanchez, liar' and 'Spain is not negotiable and cannot be sold'. 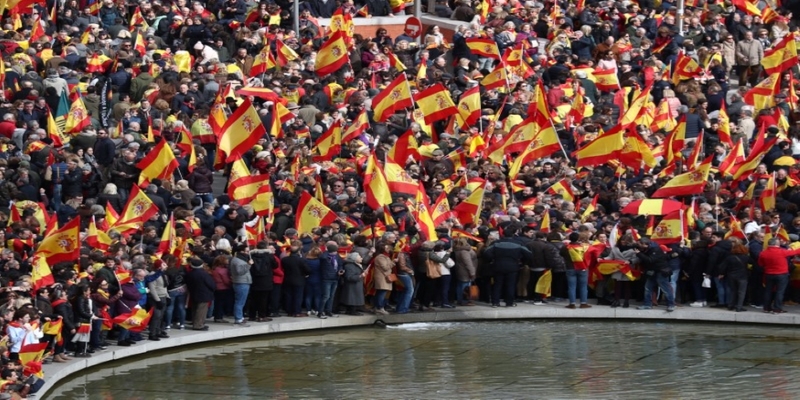 Madrid: Tens of thousands of people waving Spain’s red-and-yellow flag, demonstrated in Madrid on Sunday to oppose any concessions by the government to Catalan pro-independence parties and to call for early elections. Demonstrators chanting ‘Spain! Spain!’ and ‘we want to vote!’, filled the Plaza de Colon in the city centre in the largest protest that Socialist Prime minister Pedro Sanchez has faced in eight months in office. The opposition centre-right and far-right parties called the rally, seeking to make a show of force against Sanchez by capitalising on anger with Catalonia’s separatist leaders and the government’s efforts to establish a dialogue with them. The government’s proposal last Tuesday to appoint a rapporteur in talks among political parties to address the Catalan independence crisis galvanised the opposition, which has deemed it a betrayal and a surrender to pressure from Catalan separatists. “The time of Sanchez’s government has ended,” Popular Party leader Pablo Casado told reporters before the protest. Some banners at the rally read ‘Sanchez, liar’ and ‘Spain is not negotiable and cannot be sold’. The government is squeezed on both sides of the Catalan issue: Deputy prime minister Carmen Calvo said on Friday, the talks were on track to fail because Catalan pro-independence groups had rejected the government’s proposed framework. The Catalan groups want a referendum on independence included on the agenda, which Madrid will not accept. Ana Puente, a 73-year-old retiree who attended the gathering, said she was protesting for a ‘united Spain’.